If you are wondering what dental implants are, they are basically a screw made of titanium that is inserted into the bone in your jaw and then a fake tooth is attached to it. An implant is a great option to replace a missing tooth. It functions very well and looks practically identical to a real tooth. Your bone likes titanium and will grow right into the titanium implant at a microscopic level, fusing the implant to the bone. Once the titanium implant is inserted and the bone heals around it the implant becomes a part of your body and can’t be unscrewed anymore. It can be eaten on and looks just like a normal tooth. Dental implants look like a real tooth. This is because an implant tooth is made of porcelain rather than acrylic and the implant tooth is inserted into the implant at the bone level, so comes out of the gum like a normal tooth does. A denture tooth is made of acrylic and has only a few colour options, so never matches the surrounding teeth very well. A bridge is also made of porcelain and can match surrounding teeth well, but it sits above the gum line and looks unnatural because of this. Dental implants work like a real tooth. The implant is directly inserted into the bone, so can take the full force of chewing. A denture sits on top of the soft gum and can only be chewed on with about a quarter of the force of a normal tooth. A bridge can be eaten on much better than a denture, but the force of the bite is now on fewer teeth. If the bridge is replacing one tooth, then two teeth now take the load of three, if the bridge is replacing two teeth, then two teeth are now taking the load of four teeth…you get the idea. Dental implants prevent surrounding teeth becoming crooked. When a tooth is lost, the teeth next to it drift into the space like books do when a book is taken out from a bookcase. A dental implant will fill this space and prevent the other teeth moving into it. Dental implants prevent bone loss following the loss of a tooth. When a tooth is lost, the bone around the tooth is no longer needed and the body will gradually cannibalize the bone. As the bone is lost, your face can sink in and this can have a detrimental affect on your appearance. Only a dental implant can stop this happening. The bone treats the implant like it is a tooth and will be conserved. Dental implants don’t get decay! An implant, unlike a bridge, will never get decay as it is made out of metal and porcelain. A bridge is hard to clean under and they often fail after one or both teeth supporting the bridge get decay under them. Dental implants are much better for the surrounding teeth as they are easy to clean around unlike a bridge. Dental implants are better for surrounding teeth. A dental implant can be placed without having to do anything to the teeth on either side of the implant. A bridge requires the teeth supporting the bridge to have much of the tooth structure drilled away to allow space for the bridge to sit on. This can lead to these teeth needing expensive root canals done on them, possibly damaging the bridge during the process. Dental implants last a very long time and rarely fail. 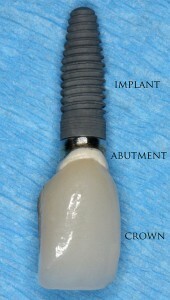 The first implants were placed in the mid 1960s. The first person to get one, died about a decade ago and it was still functioning at the time of his death. The second person to get an implant in the 1960s is still alive and the implant is still functioning! A bridgeon the other hand will typically only last about ten years. You are on a budget. Implants can be very expensive! Typically an implant costs between $4000 to $6000 just to replace one tooth. This is about twice the cost of a bridge and easily five times the cost of a partial plate. If implants are used to replace a whole mouth of missing teeth, this could easily cost over $50000! Dental Departures is an organization that can help if you need to find reputable dentists abroad who can place implants at a fraction of the cost. Click here to read more about Dental Departures. You have lost too much bone. An implant needs bone to insert into. If there is not enough bone available, then a bone graft can work, but adds to the expense. Also if so much bone is lost that the face is already quite sunken in, then a denture may be a better alternative as it can replace the lost volume with acrylic and push the lips and cheeks out better than an implant can in that situation. Serious medical condition. Implants need to be placed surgically. If you are so unwell that minor surgery is still too much of a risk, then implants are probably not a good option. This is unusual though and if you were that unwell, I doubt whether you’d be reading this article. There are other factors that decrease the likelihood of the implant working. For example if you smoke and/or have gum disease, the chances of your bone not fusing to the implant properly are greater than most. However, the success rate is still over 90% (the success rate is normally 97% or higher in healthy, non-smokers). As you can see, I am a big fan of implants. I really think they are a fantastic option for people who have lost teeth. However, implants aren’t cheap. I find most of my patients would love to get one to replace their teeth rather than get a denture or a bridge, but find the price too high. Not surprising really when you consider you could get a reasonably decent car or an overseas holiday for the price of just one implant! Speaking of overseas holidays, if you want to have a holiday and get your dental implants restored or other dental work done and still pay less for the holiday and the dental treatment, then you should read my review on Dental Departures. Hopefully, in the not too distant future, implants will become much cheaper, allowing most people to afford and benefit from them. If you have any questions about implants or would like to discuss your own experiences with them, please do so in the comments section. This entry was posted in Implants on October 25, 2015 by David. This is valuable information for me. Unfortunately, I have developed periodontal disease. I have not lost any teeth from it yet and I am now getting cleanings once every 3 months but the dentist has warned me that if we can’t start reversing the gum loss that I may start losing teeth later in life. My teeth are in good shape, it’s my gums that have taken a beating. Would someone with substantial gum loss be eligible for an implant or would I have to go another route. I’m hoping I never have to get one but I think I’d rather get an implant than get a bridge or dentures. Glad you are finding the information useful. That’s great you are getting treatment for the periodontal disease. A lot of people don’t know they have that condition until their teeth start becoming loose in their mouth. By that time, they would have lost around 67 percent of the bone that supports the tooth. Almost anyone can get an implant. However, with periodontal disease you will likely need bone grafts to replace the bone lost from that disease. This will be expensive. Also, people who have periodontal disease are more likely to have the implant fail to fuse with the bone and the implant will need to be taken out if that happens. If you have periodontal disease, the best thing for you to do is to attempt to give up smoking (if you are a smoker) and keep your teeth as clean as you can. Cleaning between the teeth is especially important in people with periodontal disease. Hope that answers your question. Hit me up if you have any other questions. This is great and easy to read and understand information! I have to thank you for sharing your knowledge with the general public to educate. I had no idea of the differences between a bridge (which I am still not sure I fully understand, so I will check out your posts on bridges), denture and an implant. I have to say that I was cringing when you described how it was installed but then I read that the person would be placed under. Makes more sense now! An implant does seem like the best option as there are less risks of infection and it feels and looks like a normal tooth. However, the price! Wow, I had no idea how expensive it would be. But if I were missing a tooth, I would much rather spend my money on a replacement tooth rather than a temporary holiday. Thank you! I am glad you liked the article. Yeah, the price of an implant is very high and most people can’t justify the expense, so opt for a cheaper option like a denture or a bridge when they want to replace a missing tooth. A lot of people worry about the procedure of getting an implant placed, but actually I rarely need to put someone under to place the implant. Believe it or not bone itself doesn’t have nerves in it, so once the gums are numb around where the implant will be placed, the placement of the implant is actually painless! It is less traumatic than having a tooth taken out even. Just what I was looking for. While these are definitely too expensive for me, it did give me another option. I am having a serious issue with my top front teeth eroding. Partially due to soft teeth and grinding in my sleep. As a trumpet I am finding it to be very disturbing and have been searching for the best solution to save them before its too late. I need solid front teeth in order to play my trumpet. I am thinking my only option will be veneers which I know are also costly. I will be visiting my dentist in a few weeks but do you have any suggestions? Thanks for the great explanation. It is amazing what they can do for out teeth. I think the first and most important thing is to prevent any further wear of your teeth from the night grinding. This is achieved by wearing a nightguard (fits like a lightweight mouthguard in your mouth). If you get veneers placed it will vastly improve the appearance of your teeth, but without a nightguard you will likely break the veneers when you grind your teeth in your sleep. If you are going to your dentist soon, ask the dentist to make you one. If you have soft teeth use an extra strength fluoride toothpaste. If you live in the USA this high fluoride toothpaste needs to be prescribed by your dentist. In some other countries you can get it directly from the pharmacy after talking to the pharmacist first. Also, if you drink a lot of fizzy drinks or other carbonated beverages, limit how often you do so as this can also wear your teeth down. Let me know how you get on at the dentist or if you have any other questions. Wow, that really is very expensive! Thank god I have free health care in Finland. Are dental implants used only to replace missing teeth or are there also other uses? Hi Matthew. I agree, it is very expensive! I have heard that Finland has free health care. What a great country! That’s a great question about other uses for implants. Implants can also be used to hold dentures securely in place and can also be used to help move teeth around in orthodontics (the implant acts like an anchor when moving the teeth).